Peter van Mierlo is CEO of the Dutch development bank FMO. 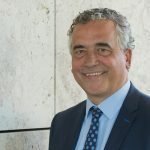 Peter van Mierlo joined FMO from PwC where he was Chairman of the Board of Management of PwC Netherlands and Managing Partner of PwC Europe. He started his career as Audit professional at Coopers & Lybrand (that merged in 1998 with Price Waterhouse to form PwC) in 1987, by 1996 he became a partner. He has since then served in a variety of leadership positions as a Transaction Leader, Member and Chairman of the Assurance Board. In 2009 he joined the Board of Management of PwC, where he was appointed Chairman in 2013. Peter van Mierlo was also Member of the Strategy Council of the international organization of PwC and Managing Partner of PwC Europe. Peter van Mierlo holds a Master’s degree in Economics from Erasmus University and is, amongst others, Member of the Board of VNO-NCW.